April 11, 2017, 3:49 p.m. This June marks two important political anniversaries. In 1987, Margaret Thatcher won her third straight election, brushing aside a divided opposition and cementing her status as the Iron Lady. In 2007, Gordon Brown entered Downing Street unelected – succeeding a charismatic but ultimately derided Prime Minister. In much of the public’s mind, in the nine months since she became PM Theresa May has been seen more like Thatcher than Brown. We have regularly polled the public on who they think would make the best Prime Minister: Theresa May or Jeremy Corbyn. 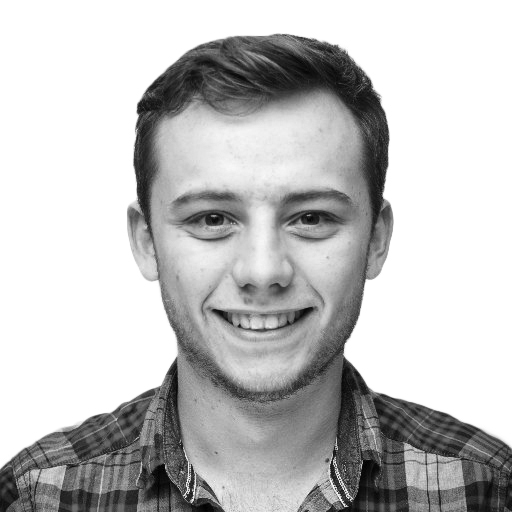 Each poll has seen May beating the Labour leader by a wide margin – occasionally as much as a three to one – with Jeremy Corbyn trailing in third place behind “Not sure”. 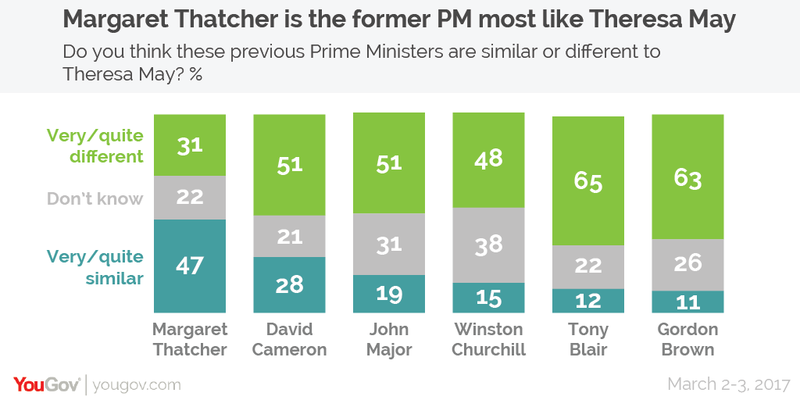 Furthermore, we found that the ex-PM the public thinks Theresa May is most similar to is Margaret Thatcher. Nearly half (47%) said the two were similar, compared to just under a third (31%) who said they were different. Being seen as another Margaret Thatcher could benefit May as recent YouGov research showed the public are impressed with the Iron Lady’s legacy, with 43% describing her as a good or great Prime Minister. This could just be a lazy comparison, driven by the fact the fact the two leaders happen to both be female and Conservative, but the current PM is also perceived to possess many of the same positive and negative characteristics that are often associated with her predecessor. 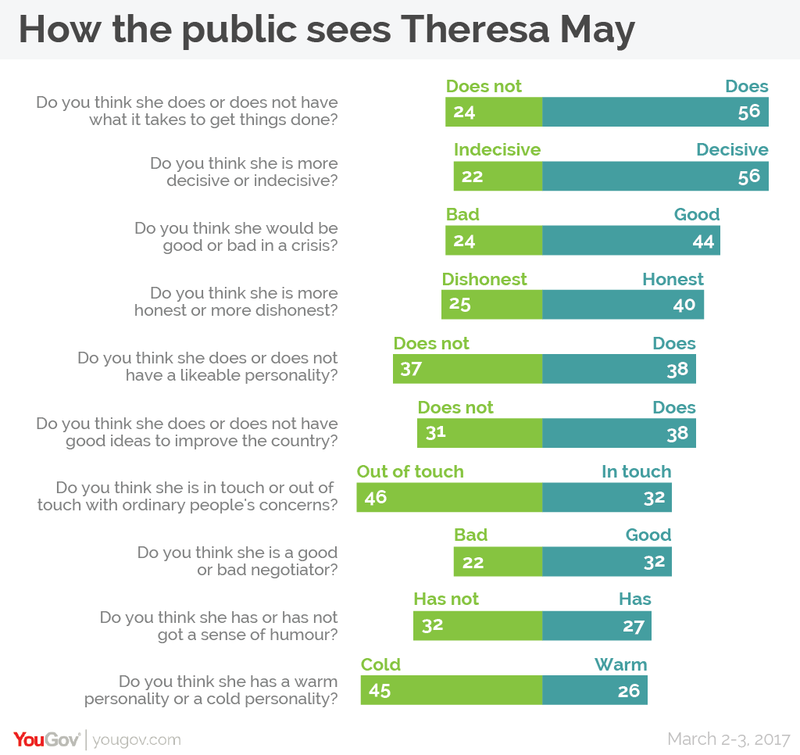 In the public’s mind, May’s biggest strengths are that she has what it takes to get things done, that she’s decisive, and that she’s good in a crisis. However there is also a perception that she is out of touch with the concerns of ordinary people and has a cold personality. It could also be that voters are using the easy stereotype of Thatcher to form their early character assessment of the current Prime Minister. But if that is the case, so far it is working in May’s favour and she performed well across seven out of the ten qualities we tested. This could also more generally be summed up as “head over heart” – sense over sentiment – which voters usually end up prioritising at the ballot box. However the PM shouldn’t rest on her laurels as she still faces two big threats that could yet alter the picture – the first being a potential change in Labour leader. 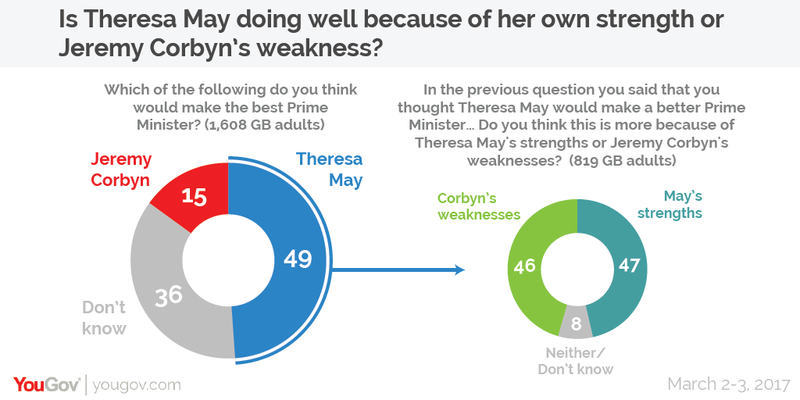 Among those who think she would make the best Prime Minister, there is a nearly even split between those who that say it is because of her strengths (47%) and those that say it is because of Jeremy Corbyn’s weaknesses (46%). Whilst some, including many traditional Labour supporters, see Theresa May as the better of two evils this could quickly change with a more popular opposition leader. The second threat is that were a few slip-ups or crises to occur, perceptions of her could quickly change – and this is where the comparison to Gordon Brown is perhaps apposite. At the start of his Premiership he was also seen as being strong but cold and also enjoyed a decent “honeymoon” period. Yet within a year of taking over, just 18% saw him as strong and 14% as decisive as his reputation was harmed by the financial crisis and his decision not to call an election. While history doesn’t always repeat itself, there are many potential crises on the horizon – whether it’s the complicated Brexit negotiations, economic challenges, or pressure on the NHS. If Theresa May can navigate them she could – like Margaret Thatcher – be remembered by many as a strong and decisive leader who has what it takes to get things done. But as if she fails then then in the public’s mind she could risk being seen as another Gordon Brown.